Living and providing for a family who are gluten allergic is much easier than I at first thought. Hypnotherapy for migraine has been recorded as successful in case studies since the mid nineteenth century (Braid. 1843, Esdaile.l848. Bernheim. 1887) and case studies remain one of the most popular methods of reporting today (Graham. 1975, Daniels. 1973. Peter. 1992). A few trials of hypnotherapy with other modalities of treatment have been reported (Andreychuk et al. 1975. Stambaugh, 1977) or with drug treatment (Anderson et al. 1975). Few investigators have reported trials on larger numbers where hypnotherapy was the only variable tested. Only one being found in the ten-year period to 1981 (Drummond, 1981) and that included only five participants (Edmeads, 1973). Despite the fact that migraine affects an estimated 10-20% of the population the numbers treated by hypnotherapy at present are small representing only a mere 0.8% of a consecutive series of 160 cases being reported as recently as 1990 (Mackett, 1990). A hypnotherapy technique similar to that used by one of authors (M.M.) has been reported as effective in treating chronic tension headache (Rooimans et al., 1992). One of the primary objectives of this study is to show that the same technique is also effective for treating migraine. Rooimans study used hospital out-patients but it is estimated that 40% of sufferers from migraine never see a doctor and deal with their problem on their own. We theorise that a group of self and doctor diagnosed volunteers from the membership of The Migraine Action Association would represent a truer cross-section of the overall disease pattern than those previously investigated. Also, the provision, at a distance, of an audiotaped intervention would reduce clinician contact to a minimum and so reduce any risk of clinician induced errors of standardisation. This would place the testing of the patient in their own environment rather than the laboratory and would make the study more valid for and reproducible in a "Real World" setting. Our hypothesis is that the provision of a standardised version of our anecdotally successful intervention on an audiotape will produce a significant reduction in overall migraine severity score when baseline scores are compared with post-test scores. The trial was an interrupted time series design using a single group of participants with 84 pre-test data points and 105 intra-intervention data points. The pre-test data diary was sent to the researcher before the provision of tape and post-test data diary in order to minimise participant contamination of pre to post test recording. 52 people responded to an article published in the newsletter of The Migraine Action Association that explained the rationale behind the trial and asked for volunteers. 33 of these responded positively to a letter explaining the protocol and received a 12-week pretape diary. All retumed this and received a tape and 15 week post-test diary. The ages of those participants who returned analysable data were in a range from 35-72. Mean age was 52.04 (SD. 9.58) 22 were female and 1 was male. There was no attempt to assess hypnotisability or proof of diagnosis. The user's belief that they had migraine was regarded as sufficient. All volunteers were entered regardless of the severity or frequency of their migraines and no one was subsequently excluded on those grounds. Investigative bias was minimised by restricting contact to standard letters except in extreme circumstances. The daily diary chart was recorded for 199 days. Of these there were 84 pre-test scores and l05 post- test scores. Headache, vomiting, nausea, tingling, post-headache tiredness and any participant determined symptom was scored on a scale of 0 to 10 (0 being absent, 10 being intolerable) and recorded on the diary sheet with the number of hours it was present in the relevant day. These were combined to produce a total symptom score for each day. These were consolidated for post and pre-test total scores with the appropriate adjustment for the increased length of the post test. The tables obtained appear under results. Participants were asked not to change any medication during the course of the trial. Induction was by Elman's Eye Roll. deepening by The Glasgow Dental Hospital technique of three big breaths and sustained by a visualisation of a calm place. The specific technique was a three-stage process involving a symptom modifying routine based on blood flow. a symptom substitution technique using recognition of internal conflict and a simple conflict resolution procedure. The user was asked to play side one until he/she was familiar with it and then concentrate on side two using this at least once at day until proficient then at least once a week thereafter. 29 full sets of diary charts were retumed by the participants. of these 23 were analysable. 2 were rejected due to changes in drug treatment during the trial. 1 was rejected due to symptoms being unquantified. 1 was rejected due to headaches being ascribed to sinusitis and 1 was rejected due to diary charts for the baseline being completed from personal diaries with inadequate information. 1 was rejected due to multiple illnesses including M.E. Full analyses were carried out on 23 complete sets of recording diaries. From the analysis 19 (83%) participants had an overall reduction in symptomology and 4 (17%) had an increase in symptoms, though for 3 of those who did not improve the increase in symptom score was less than 10% and is not significant. 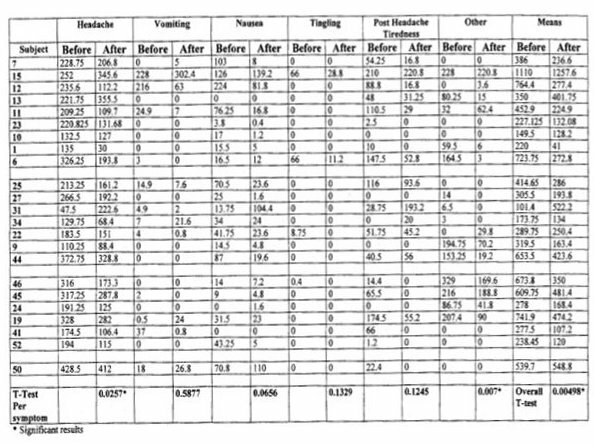 The raw data from the participants was analysed in the following manner and has been tabulated in Appendix 1. For each symptom a period of time (recorded in hours) and a rating from 0- 10 of severity of the symptom were multiplied out to give an overall score for each bout of each symptom. These were then added together for each 3-week period of the pre and post tape diaries. This enabled not only an analysis of the total differences between pre and post tape diaries but also enabled consideration of the data in each period. 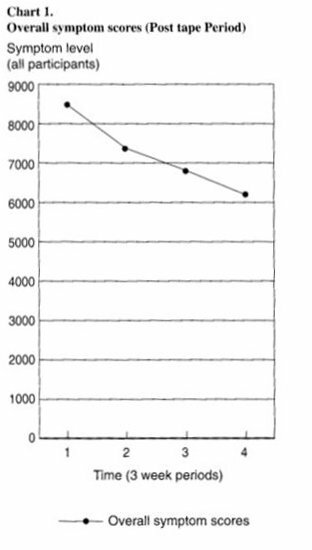 Below is a chart showing the progressive reduction of overall symptoms during the study section where the tape is employed. (Chart l). Migraine is an episodic condition of varying frequency and severity even within the individual. It is thus difficult to assess and quantify. A 12-week baseline was chosen as it was felt to be long enough to pick up any patterns that are often associated with the menstrual cycle. We found that 6 weeks would have been sufficient as a baseline as our first 6-week period equated well to our last six-week period. We felt the 4 weeks chosen by others (Anderson et 211 1975) was probably too short. Migraine is it disease of unknown aetiology although the pathological process is reasonably well understood. We are less certain of the nature of its triggers. The causes of each attack seem to fall into a number of categories only one of which - the psychological process - we have attempted to manipulate. It was felt that a total period of 27 weeks was sufficient to eliminate the random errors and make our intervention the only variable and thus ensure the robustness of the results of the study. A number of conditions are seen to worsen with stress (psoriasis, eczema, IBS. migraine. M.E.) It is postulated by our theory that these disparate symptoms are manifest as a signal of an internal conflict between competing parts of the subconscious mind. They constitute an avoidance mechanism whilst the parts fight for dominance and represent an atavistic move towards a self-acceptable morbidity to remove other stressors while that fight takes place. They may be a learned process in which, for instance, the social phobic child who has an attack of vomiting when due to go to a party, learns that vomiting is an acceptable tactic to avoid noxious social stimuli. This theory leads to a technique in which the sufferer is invited to consider the presence of an internal conflict, to recognise it, to change the symptom (migraine) to something less disabling and to use a simple conflict resolution technique. This theory seems to have been borne out in one of the covering letters received from a participant who noted that the symptoms worsened during the time the conflict was being addressed and then resolved on its being solved. We have also observed that 30% of our participants had a static or slightly worse period for the first 6 weeks of follow up and that would support this theory. Drummond's (1981) review of the literature shows the favourite (Edmeads. 1973, Graham. 1975, Anderson, 1975) hypnotic technique involved some visualisation of constricting arteries. This was incorporated in our study using the imagery of pipes and valves where the user inserted restricting devices into the valves to stop the pipes being opened or closed too far. The technique is intended to be as non-directive as possible to allow the patients to develop their own imagery. This is a particularly important part to reduce any abreaction due to misassociation with inappropriate imagery. We were conscious that the user would have no contact with us (although one of us, M.M., was always available by telephone) and it was important that the technique was safe. There was only one report of an adverse reaction during the study and that was of transient dizziness ascribed to this technique of pipe control but which stopped when this part of the tape was ignored. The patient did report satisfaction with the other aspects and a reduction overall in headache score was obtained. We are very conscious that measures of hypnotisability are used for most research but patients as they walk through our doors do not present themselves ready categorised and we have to deal with each one as we find them. We especially wanted to carry out 'real world' research on a group whose characteristics were defined by nothing more than a diagnosis of migraine and a willingness to participate. Thus our group is likely to be representative of migraine sufferers at large. It was with this in mind and knowing that a sizeable number of suffers seek no medical help that the aid of The Migraine Action Association was enlisted to assist recruitment of our volunteers. Our results show an overall statistically signficant improvement (P=0.005) with the scores continuing to improve each three-week period over the study. We would expect this improvement to continue as the intervention represents a learning process and a tool that the user has available for all time. It cannot be unlearned - only overlooked. We cannot isolate which of the treatment strands was most successful and would not wish to. The provision of an audiotape allows complicated treatments to be provided and rehearsed at home by the patient. This can reinforce the learning of the consulting room and allow each therapy session to be based on homework done between sessions. The taped hypnotherapy intervention significantly improved the migraine scores overall and would represent a useful addition to the current preventative measures. We would advocate the taping of consulting room sessions for patient use as homework (Finkelslein. 1989). Migraine affects such a large number of people and as prophylactic treatment is not very effective we conclude that hypnotherapy in this form has an important contribution to make in its treatment.